Kiss was formed in New York in '72 by guitarist/vocalist Paul Stanley (Stanley Eisen) and Gene Simmons (Gene Klein). The line-up was rounded out by drummer Peter Criss (Crisscoula), located through a Rolling Stone ad, and lead guitarist Ace Frehley (Paul Frehley), who answered an ad in the Village Voice. The band's cartoon image, kabuki makeup and 4th-of-July stageshow concept was in place from the start, and they began promoting their own hall shows in NYC. TV director Bill Aucoin saw them, became their manager, and secured a deal for them with Neil Bogart's Casablanca Records within two weeks. Three LPs were released in a year's time, but the live fourth LP, Alive! (1975) contained their first huge hit, "Rock And Roll All Nite." Until the early '80, Kiss was unstoppable, with two huge-selling Marvel Comics, a network TV movie and four simultaneously-released solo albums under their studded belts. In '80, Criss left for a solo career and since then, the drum and lead positions have been ever-changing. In '83, the band stripped away the makeup and celebrated renewed interest. "You wanted the best, you got it! The hottest band in the land: KISS!" So went the rally cry at the beginning of a Kiss concert, an event of exploding pyrotechnics, vomited blood and louder-than-God hard rock. 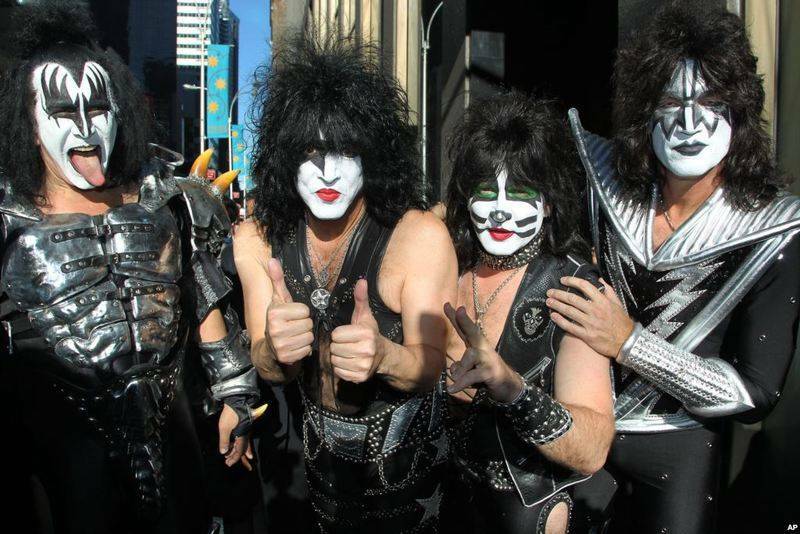 Their fan club--The Kiss Army--swelled to six-figures strong during the band's '70s heyday, and between 1974 and today they've sold in excess of 70 million albums.In '96, the original band reformed (made up? ), and took their full costume-makeup-pyro 1976 show on the road--for a year-long stint--resulting in one of the most successful rock tours ever. Conjecture that the band wanted to quit on a high note has remained unproven; anything could happen in Kiss' future. Psycho Circus is the eighteenth studio album by American rock band Kiss.The album features the original four members back together and in full make-up. Some pressings featured a lenticular cover that alternates between a black Kiss logo and the album title with pictures of a clown and the band members, while the Japan initial first pressing featured a pop-up cover which had three foam spring-loaded panels of a clown face and two others with band members faces that popped out when the doors were opened. "You Wanted the Best" is the only Kiss song in which lead vocals are shared by the entire lineup.Following the highly successful 1996–97 reunion tour, Psycho Circus was marketed as the first new studio album by the band's original lineup since 1979's Dynasty (as Peter Criss did not participate on 1980s Unmasked, although Criss' drum work is limited to only one of the nine songs on Dynasty). As with Dynasty and Unmasked, however, many of the songs were recorded by uncredited players. Ace Frehley and Criss were used sparingly, with Criss playing drums only on "Into the Void". Frehley played on two songs from the album (not including vocals). In 2011, in Frehley's book No Regrets, he says that he wrote a lot of songs for the album, one of those songs being titled "Life, Liberty, and the Pursuit of Rock 'n' Roll". He mentions that the title and song were deemed very similar to the song "I Pledge Allegiance to the State of Rock 'n' Roll". Frehley would record the song under the title "Pursuit of Rock and Roll" for his 2018 solo album Spaceman. "Into the Void" was originally titled "Shakin' Sharp Shooter", but Simmons and Stanley were unhappy with the lyrics and title, so Frehley went up to a separate room and rewrote it. 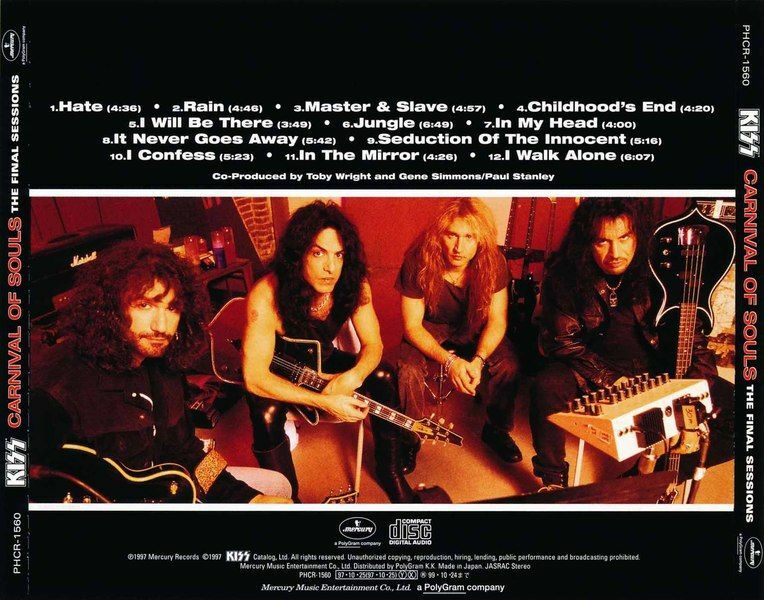 The song "Within" was originally written and demoed for Kiss's previous album Carnival of Souls: The Final Sessions and contains the original backwards guitar intro from the demo by previous Kiss member Bruce Kulick. Psycho Circus debuted at #3 on the Billboard 200, selling 110,000 copies in its first week of release, and was certified gold by the RIAA on October 22, 1998.Rolling Stone said, "Psycho Circus is an album of platform-stomping rhythms, roller-coaster guitar riffs and sing-along choruses – is far more respectable than any of the awkward flops from the no-makeup years. "Entertainment Weekly (9/25/98, p. 106) said, "This is rock with a capital R, captured in all its cheesy glory... This new effort proves that in the circus of hard-rock dinosaurs, Kiss remains its Barnum & Bailey." "Well up to the band's usual standards of corny hoopla," wrote Clark Collis in The Daily Telegraph. "Typical of the beast is 'I Pledge Allegiance to the State of Rock & Roll' – three and a half minutes of hilariously bombastic pomp-rock that simply crushes thoughts of all post-glam musical developments beneath a silver-painted stack-heel boot. "The song "Dreamin'" bears a resemblance to Alice Cooper's "I'm Eighteen" (1970): a month after the release of Psycho Circus Cooper's publisher filed a plagiarism suit, settled out of court in Cooper's favor. Bruce Kulick - backwards guitar intro & solo on track 2, bass on tracks 1 and 9, rhythm guitar on track 9. Alive! 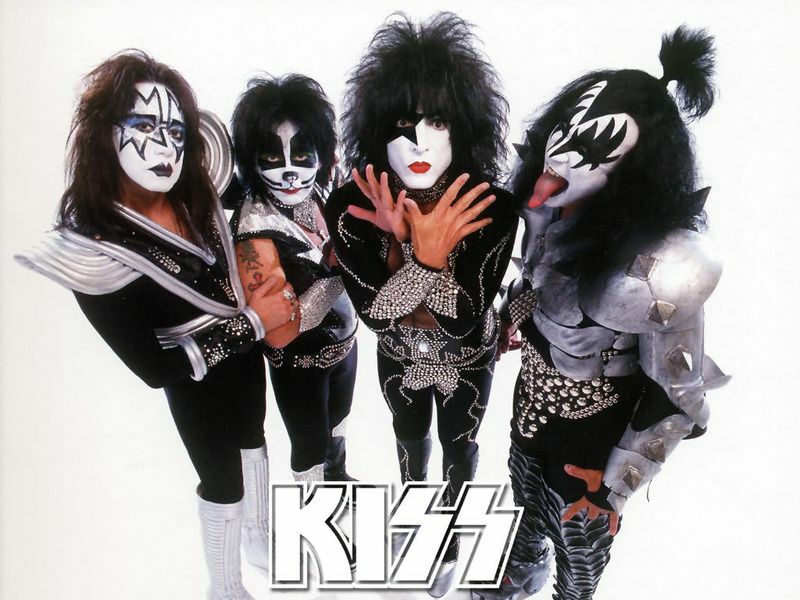 is the first live album, and fourth overall, by American hard rock band Kiss. It is considered to be their breakthrough and a landmark for live albums. Released on September 10, 1975, the double-disc set contains live versions of selected tracks from their first three studio albums, Kiss, Hotter Than Hell and Dressed to Kill. 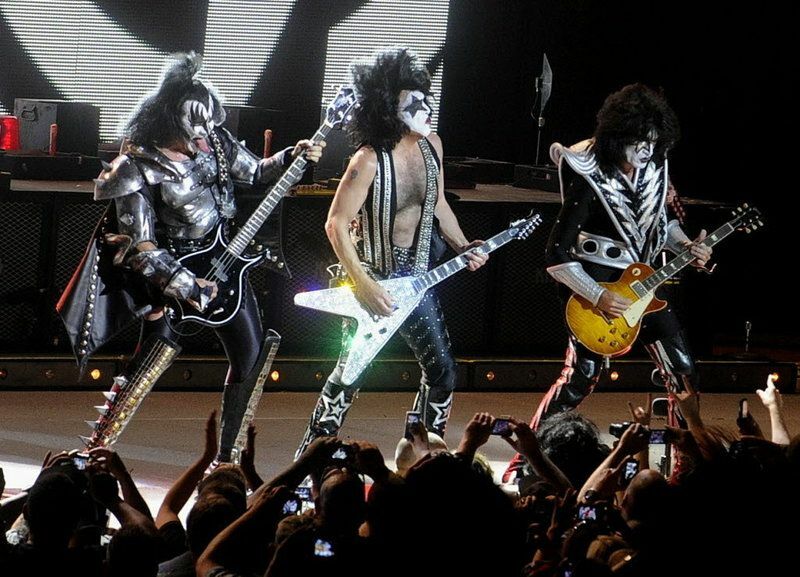 It was recorded at concerts in Detroit, Michigan; Cleveland, Ohio; Wildwood, New Jersey; and Davenport, Iowa on May 16, June 21, July 20 and July 23, 1975.Despite their reputation and success as a live act, which emphasized theatrics as much as it did music, Kiss' fame did not translate to increased record sales. Fans told the band that their albums were not capturing how the band sounded live, so the band decided to release a live album. Kiss was essentially surviving on then-manager Bill Aucoin's American Express card. Complicating matters was the fact that their label, Neil Bogart's Casablanca Records, was having financial difficulties of its own stemming from a major misstep. The label had released a double album of Johnny Carson monologues earlier in the year. The album was a flop, but Casablanca had pressed millions of copies in anticipation of it being a strong seller.Casablanca, however, did think a Kiss live album would be a respectable seller. The album outperformed expectations as it was certified gold, becoming both Kiss' and Casablanca's first top 10 album. Years later, Paul Stanley and Gene Simmons recounted that in the weeks after the release, they saw a significant increase in concert attendance. In the documentary Kiss: X-treme Close Up, Stanley remembers that at one particular show in Dayton, Ohio, "the place was packed; I mean you couldn't have gotten another person in with a shoehorn".The album's title was a homage to the 1972 live album Slade Alive! from the English rock group Slade, a band that heavily influenced Kiss.Alive! was first issued as a double-CD set in what has now become known as a "fatboy" 2CD case. 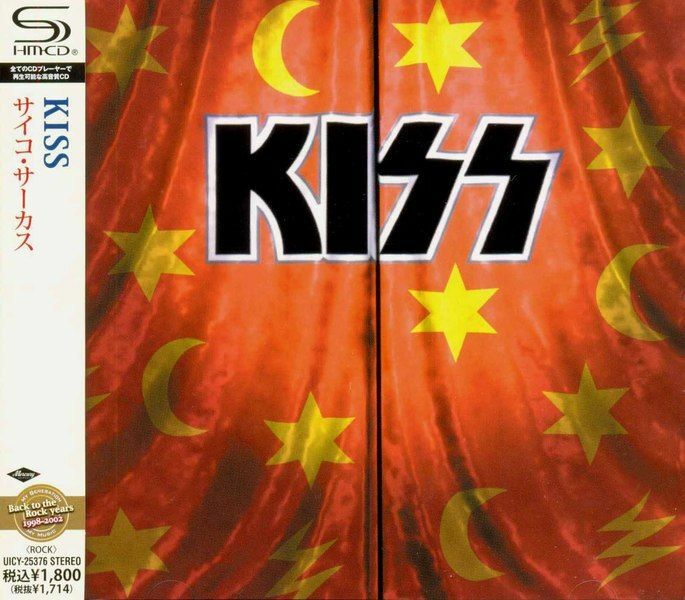 When the Kiss back catalog was remastered, it was housed in a slimline 2CD case, and in keeping with the rest of the reissue program, had the artwork restored. Alive! was re-released in 2006 as part of the Kiss Alive! 1975–2000 box set. The short running time of Alive! allowed for a single, unedited CD edition in that release. The remastered CD edition eliminated the breaks between the four sides of the original LP release, resulting in that version of the album playing as one continuous performance. The 72-page booklet packaged with the CD set erroneously credited songwriting for "Cold Gin" to Stanley instead of Ace Frehley. 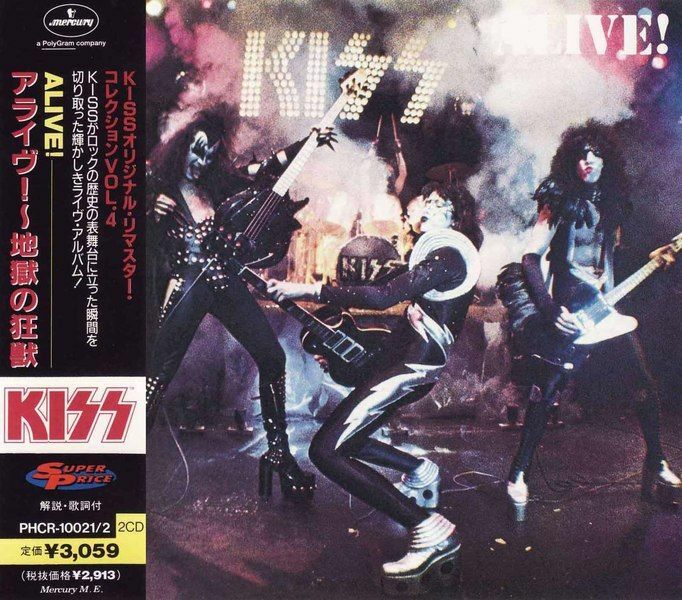 Alive II is the second live album (and eighth overall) by American hard rock band Kiss, released on October 14, 1977 by Casablanca Records. The band had released three albums (Destroyer, Rock and Roll Over, and Love Gun) since the previous live outing, the 1975 release Alive!, and the band drew upon the variety of new tracks, with Eddie Kramer producing. The origins of Alive II go back to early 1977 when the band's manager Bill Aucoin suggested that Kramer record a live album during the evening show at Budokan Hall in Tokyo, Japan on April 2, 1977. The plan was to release a live album to give Kiss some much deserved time off before recording the album that would become Love Gun later that autumn. Kramer finished work on the album, but Casablanca and Kiss deemed it unusable, and the band forged ahead with their Love Gun sessions.Most of the live tracks on Alive II were recorded during the band's August 26–28 shows at the Forum while on their Love Gun Tour. The 3 p.m. soundchecks at the August 26 and 27 shows were recorded, and later used on the album (i.e. "I Stole Your Love") with crowd noise being dubbed in later. "Beth" and "I Want You" were lifted from the aborted Japanese live album and used on the finished Alive II. 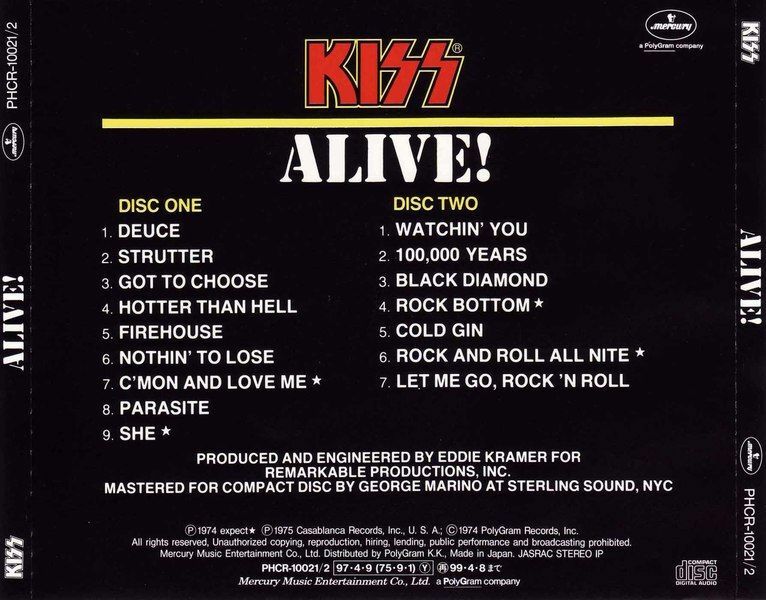 As the band did not want to duplicate songs included on Alive!, the songs chosen for the three live sides of the album were all drawn from Kiss' three preceding studio albums: Destroyer, Rock and Roll Over and Love Gun.On the original double album, the songs on side 4 (tracks 6–10 on the second CD) are studio tracks recorded September 13–16, 1977.Although Ace Frehley was originally credited for lead guitar on the studio tracks, the remastered version released in 1997 confirmed what had been speculated by Kiss fans for years: Bob Kulick actually played lead guitar on three tracks ("All American Man", "Rockin' in the U.S.A." and "Larger Than Life"), not Frehley. Frehley's sole involvement for the studio songs was "Rocket Ride" (originally written for a solo album, on which he sang lead vocals and played both guitar and bass guitar. Paul Stanley played all guitars on "Any Way You Want It", which was originally recorded by the Dave Clark Five in 1964.Several early copies of the album's cover featured a rare misprint of three additional songs ("Take Me", "Hooligan" and "Do You Love Me?") with a slightly altered song order. None of these additional songs appeared on the LP. On the misprint, "Take Me" is after "Detroit Rock City", with "King of the Night Time World" appearing after "Ladies Room" on Side 1. Side two features "Hooligan" after "Shock Me", which is placed after "Hard Luck Woman". On Side 3, "Do You Love Me?" appears after "God of Thunder", with "Beth" sandwiched between "I Want You" and "Shout It Out Loud". "Hooligan" and "Take Me" were performed on the 1977 Love Gun tour, and "Do You Love Me?" was performed on the Japanese tour that same year, making their consideration for inclusion with the second live album possible. 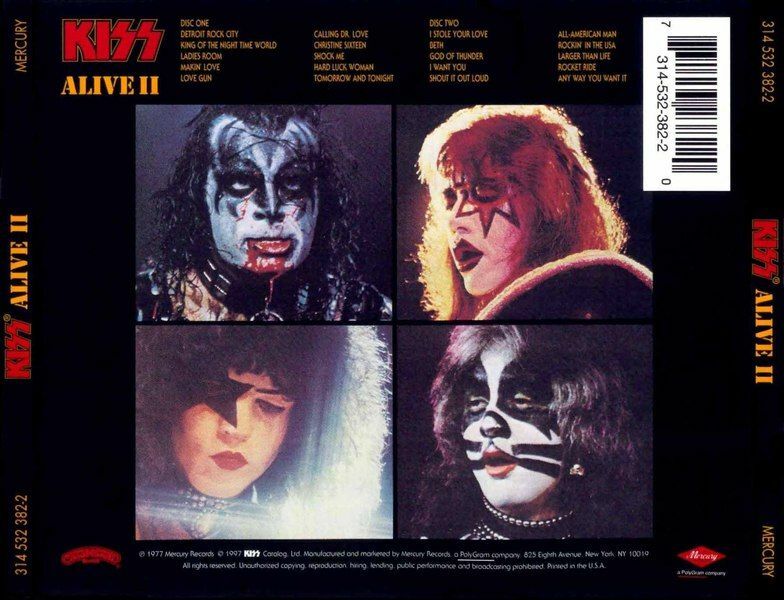 Alive II was originally reissued as a double-CD set in what has now become known as a "fatboy" 2CD case. When the Kiss back catalog was remastered, it was housed in a slimline 2CD case and, in keeping with the rest of the reissue program, had the artwork restored. This included the set of tattoos. 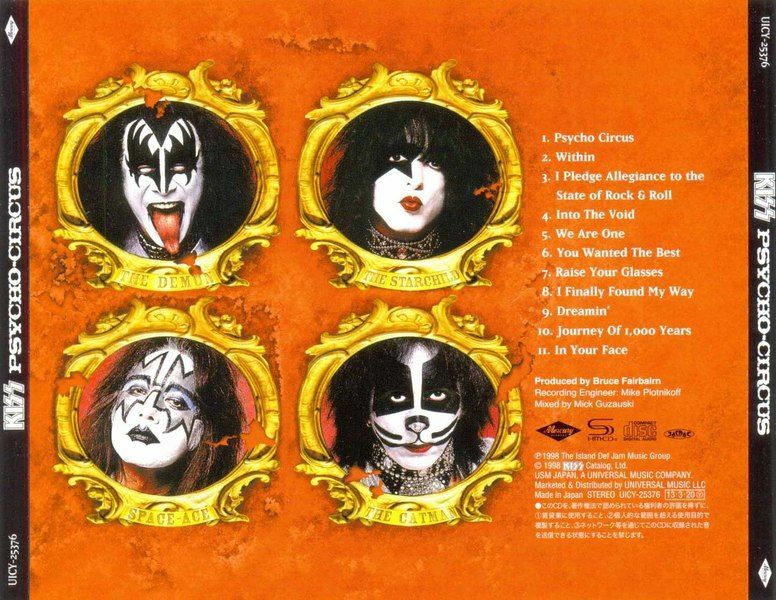 The booklet "The Evolution of Kiss"' and the picture inner sleeves were incorporated as part of the CD booklet. 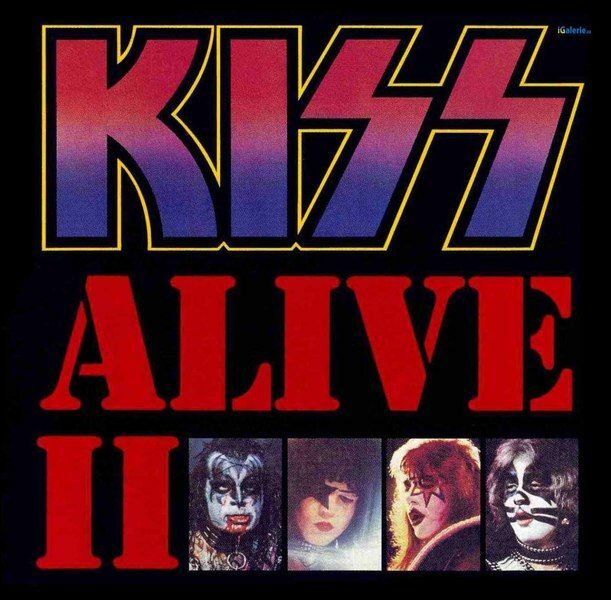 Alive II was re-released in 2006 as part of Kiss Alive! 1975-2000. It included "Rock and Roll All Nite" (single edit version) as a bonus track. The short running time of Alive II allowed for a single CD edition in the latest release.Coming off of a period of extensive touring, Alive II received a huge fan response and critical acclaim, reaching the No. 7 spot on the Billboard 200 chart. The album has received praise from several critics. In a retrospective review, critic Greg Parto of AllMusic remarked that several tracks such as "Detroit Rock City", "Shock Me" and "Shout It Out Loud" featured an "adrenaline-charged" vibe. He lauded the album for showing the group in its element as an "exciting live band". 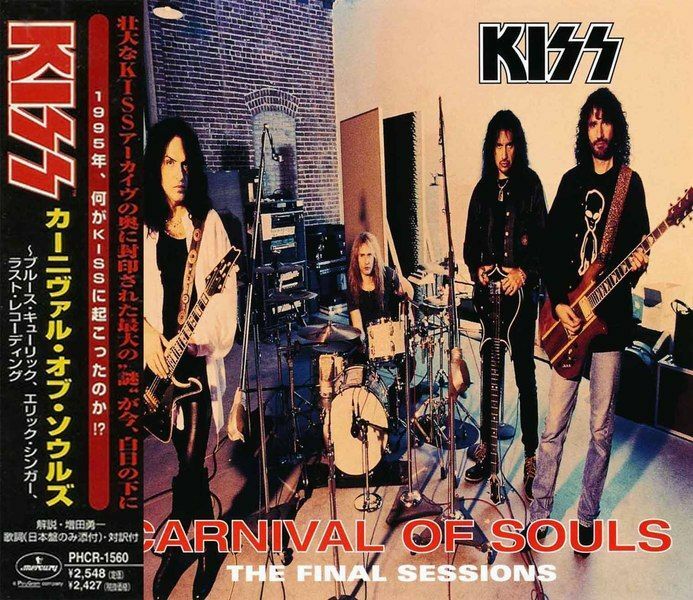 Eddie Balandas – Introduction on "Detroit Rock City"
Carnival of Souls: The Final Sessions is the seventeenth studio album by American rock band Kiss, released in 1997. It is the band's final album with lead guitarist Bruce Kulick, as well as their last album with drummer Eric Singer until 2009's Sonic Boom. The album is a departure from the band's classic hard rock style, in favor of a dark and dense grunge-oriented sound.It is also the band's last album of their unmasking era.The album was recorded between late 1995 and early 1996, but Kiss cancelled its release after committing to a reunion tour with the band's original lineup. Bootleg copies were circulated by fans, prompting the band to officially release the material in 1997 under the title Carnival of Souls: The Final Sessions. According to guitarist Bruce Kulick, the bootleg versions in distribution lacked songs that are part of the official release. There was no accompanying tour to support the album, and none of the songs on Carnival of Souls have ever been performed live by Kiss.Two former members of the band Black 'N Blue co-wrote songs on Carnival of Souls; vocalist Jaime St. James co-wrote "In My Head", and guitarist Tommy Thayer collaborated on "Childhood's End". Thayer would join Kiss as the band's permanent lead guitarist in 2002. The album's closing track, "I Walk Alone", features lead vocals from the band's then-lead guitarist Bruce Kulick, his only lead vocal performance with the band. Guitarist Bruce Kulick wrote at his official website that Carnival of Souls had "people equally vocal about it being their favorite Kiss CD or thinking it's the worst Kiss album ever".The album reached #27 on Billboard charts and the only single released from the album, "Jungle", made #8 on the US Mainstream Rock (chart). No music video was made to promote the single, which later won a 1997 Metal Edge Readers' Choice Award for Song of the Year. Bruce Kulick – lead guitar, backing vocals, bass on "Rain", "I Will Be There", "Jungle", "It Never Goes Away", "In the Mirror", and "I Walk Alone"